Crawfish usually come fully into season midway through Lent. 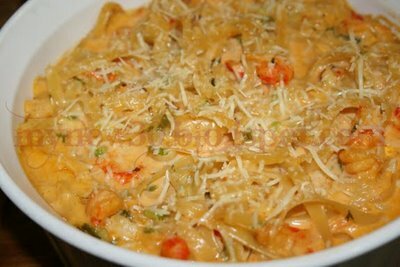 As a result, one of my family's favorite Easter dishes is Crawfish Fettuccine. It's a nice fattening celebratory splurge after the restrictive fast of the Lenten period so this is the only time I make it!! This dish is absolutely fabulous and really not all that difficult to prepare. You will need a very large pot and two large 9x13 casserole dishes (or equivalent), however. This recipe makes enough for a fairly large gathering or you can have plenty of leftovers. It also freezes well. Just put it into gallon size ziplock bags and squeeze all the air out before sealing the bag closed. Lay the bag on its side and flatten it as much as possible before placing it in the freezer. Shrimp may be substituted for the crawfish. Beware! Crawfish Fettuccine produces cravings!!! Put pasta on to cook. In the large pot, saute vegetables in 2 sticks of butter. Add flour, blend well. Add peppers & crawfish. Reduce heat, cover and simmer until crawfish are done. Raise heat a little, add cheese and Half & Half slowly. Stir frequently until cheese melts. Drain cooked pasta. Add remaining stick of butter to crawfish mixture and allow to melt. Stir well. Mix pasta and crawfish mixture together until well blended. Separate mixture into 2 lg greased casserole dishes. Sprinkle liberally with Parmesan cheese and bake @ 350 for approx 20-30 minutes or until bubbly and browning on top. Serve with a nice salad and french or garlic bread. I'm pretty sure Ryan is going to be thrilled with this blog... new stuff coming to our kitchen soon! I'll let you know how it goes! Please do let me know how things go and if you have any questions, email me! I'll give you my phone number if you want it. Also, I think the Louisiana cuisine night is a fabulous idea and should be loads of fun! Im cooking this friday for my friends "dirty thirty" party. Wish me luck !